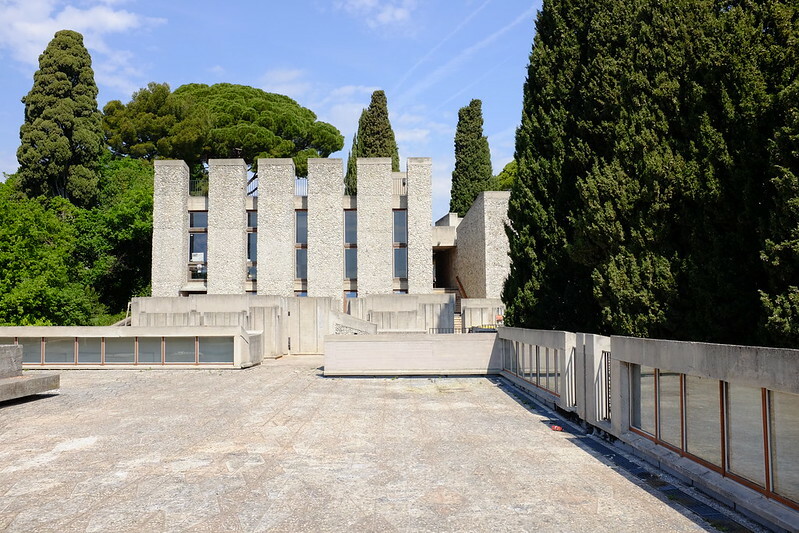 While slowly falling into disrepair, and encouraged by André Malraux the French Minister of Culture, in 1965 the City donated the remaining property to the French state to build a new type of art institution. Something like an international, experimental, cultural research centre; consisting of an art school, exhibition space, small apartments for exchanges of artists and students, workshops, gardens, and a theatre. The project was entrusted to architect Michel Marot, who decided to keep and incorporate the 19th century villa and as many of the ancient trees, including centenial Cailletier olive varieties – they produce the small black olives famous in the region – 200 year old parasol pines, cedars, oaks and cypresses, as possible. The result is astonishing, a low hill-hugging building that extends over 17,000 square meters, it flows with the topography and around the ancient trees. 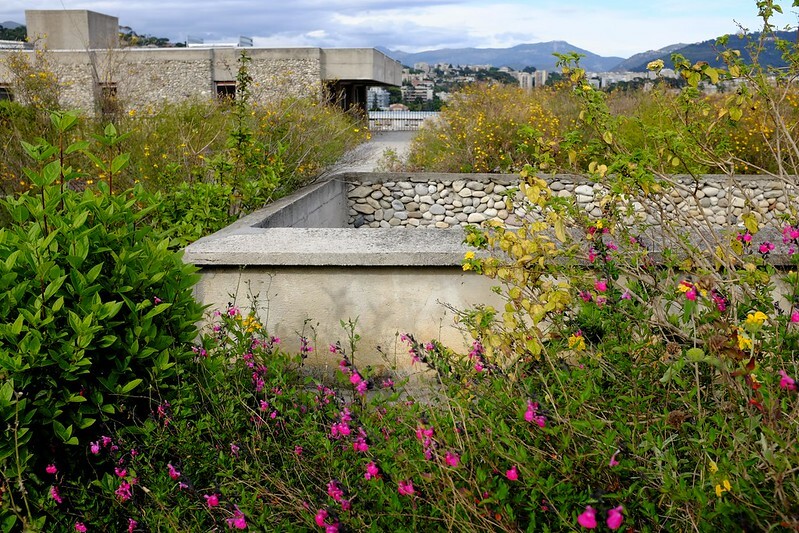 The sequence of buildings are articulated through three 'steps', following the previous parterres, each with a huge south facing roof gardens planted with drought loving flowers, shrubs and herbs. According to Marot, the buildings are 'like a lizard in the sun'. The art school complex is circumscribed by high walls pierced with long vertical windows, to maximise internal wall space, and, as much to enable views out, as to let light obliquely in. A central 'street' leads from the main entrance in the north, across a garden, into the building and following the crown of the hill wanders over 300 meters down to the bottom of the site. It exits via a southern gate close to the local church and cemetery, a gift of the monks. If you turn right, you connect to a famous, densely shaded avenue of cypresses, a remnant of the 19th Century Romantic garden and can loop back to the entrance along the western edge of Saint-Barthélémy's hill. The central 'street' runs both inside and outside of the buildings. 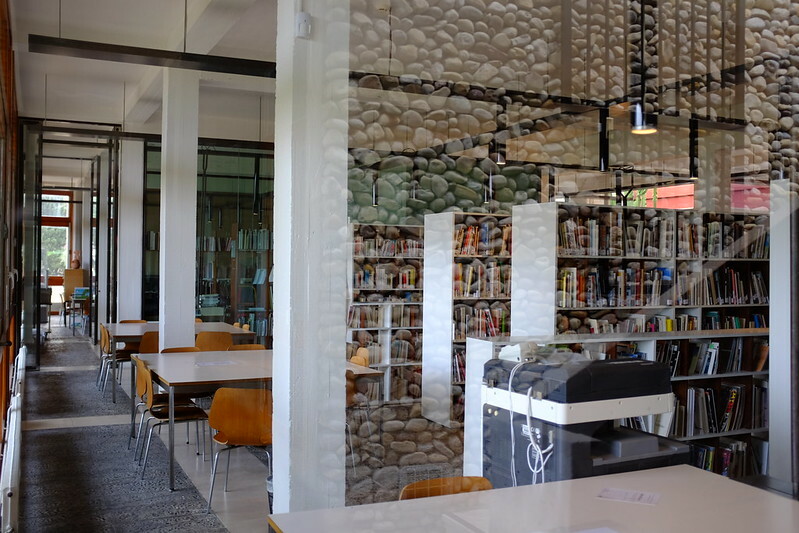 When inside, branching warren-like side 'streets' connect to clustered spaces, spaces for reception, studios, galleries, workshops, administration, services, canteen, library, and tiered lecture rooms. When outside - and you are often outside, as the topography steps down and away, being inside on one level means as you walk you are on the roof terrace of the buildings below - the 'street' also connects the various gardens, squares, and patios that punctuate the architecture. These are the external public places, places to assemble at various scales and for different events, from student chats, lunch, formal seminars or 'open' workshops. 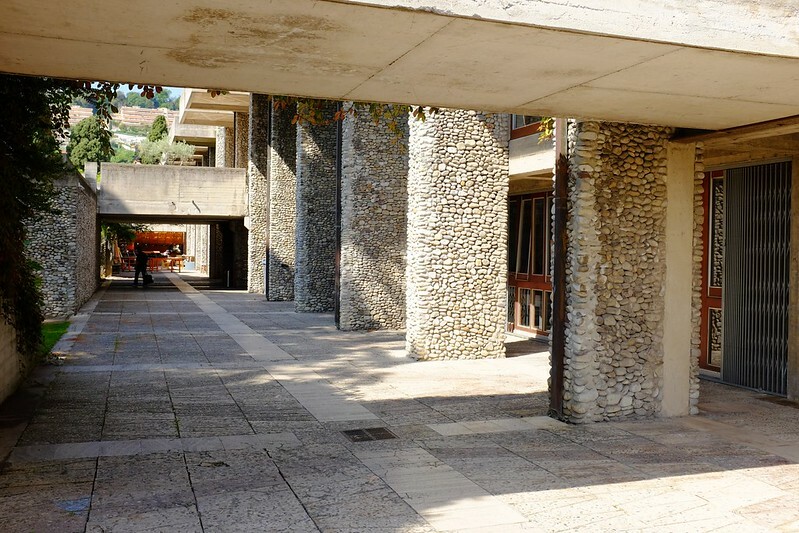 All the buildings are constructed from cast concrete and carry the rough imprint of the wooden form-work that shaped the viscous concrete as it set. Hence the 'brutalist' epithet. It's a process that links the building conceptually and materially to the South Bank or Barbican Centre in London. A predominantly grey- although often painted white internally- cubic, concrete skeleton is wrapped externally, or more accurately clad with Var pebbles -from the south east of Provence- set into huge panels that turns the façade into a rippling skin. Up close the pebbles add a sense of craft; you can see design decisions, patterns emerge, you can read sequences and improvisations, they leave a quirky trace of an individual, a person. People made this. From a distance, the pebbles soften the architectures angular geometry, they dapple the bright sun light of the Cote d'Azur. Through the pebbles it's possible to glimpse the extraordinary labour and skill necessary to make the building, as it is in the pebble-pressed, triangular concrete tiles that unify - internally and externally- all 17,000 sq meters of floor space. Extraordinary. Marot named the tiles after his first wife Veronico. The spectacular Veronico tiles cover the three distinct terraces, you descend in sequence from the Panoramic, to the Labyrinth, and on to the Lower. As you wander through the beautiful roof-top gardens, a collection of 'follies' reveal themselves, including two huge obelisks – that act as chimneys for the kilns below in the ceramics studio, a ziggurat – containing a huge light-well for the painting studios below, a pergola, an amphitheatre – for performances, two labyrinths, one of whose walls act as shade for some of the roof-lights, complex alcoves and 'secret spaces' for intimate meetings, and a belvedere. The roof gardens are surprisingly dense social spaces, places to work, meet and even get lost. One whole side of the Labyrinth terrace is gridded with pyramidal roof-lights that Marot named Pyramidions, these turn the sharp mediteranean light into diffused illumination for the studios below. As a rule, light slides obliquely into the bunker-like buildings, through rooflights, narrow windows, baffled ceiling slits or filtered through dense foliage. As the terraces step down, large overhanging cast-concrete brise soleil provide shade for the windows or 'streets' below, and above they become huge planters. The terraces themselves cover 5,000 square meters, with roughly 1,000 meters planted as a 'drought resistant' garden. 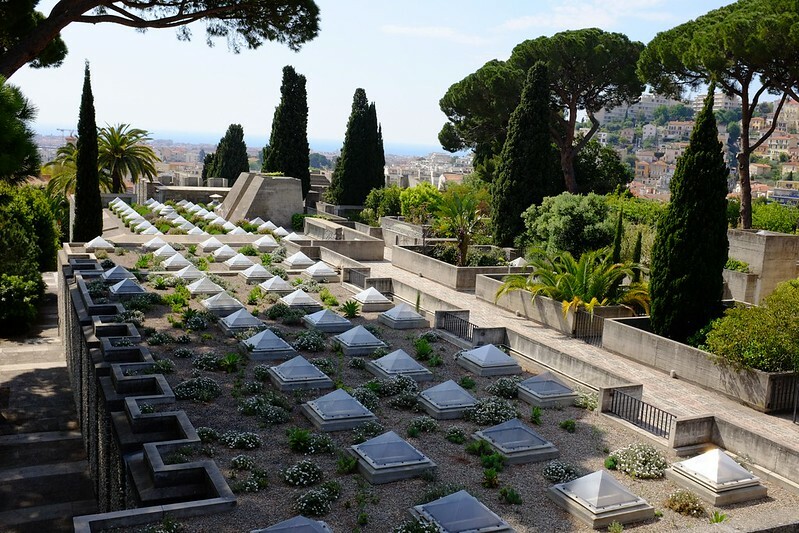 With advice from the nearby Musee International de las Parfumerie, in Grasse, fragrant plants fill the gardens, plants such as lavender, jujubes, jasmine and camphor. 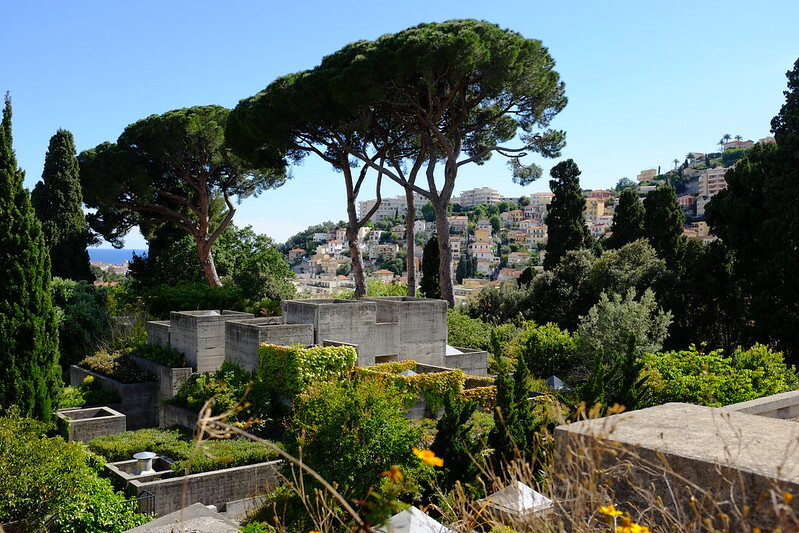 Utopian indeed, the Villa Arson is a complex assembly of the vegetable, mineral and animal, its listed Patrimoine du XXe siècle, a site of heritage of the 20th century. Related events include More things [..], Utopoly and Resilience.